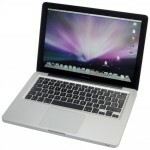 Well the new MacBook Pro was announced yesterday and I have to admit that will be replacing my existing MacBook. It’s lasted me well though, it’s just over 4 years old now and it still runs. It is one of the old Duo Core versions in Black from 2006, and I have managed to convince myself that 4 years is more then acceptable as an upgrade lifetime. The old machine will not go to waste though and I’m sure I will find a new home for it. So what is it about the new MacBook Pro that looks appealing to me? Well for starters I will be upgrading from the old polycarbonate case to the unibody one. Which means that I won’t have any more of the laptop face plate falling off when I close the lid. The polycarbonate MacBook has a habit of losing chunks of plastic from the edges when you open and close the lid, and I even had keyboard replaced on my old one it got that bad. Then there is the processor upgrade. The new dual-core i7 chip is a massive upgrade in processing power, though the only thing I use which eats up processor power is MS Office or MAMP, when I’m crunching large amounts of data in PHP or MySQL. I cannot imagine myself needing or using the 15″ or 17″ machines so I think my preference will be the 13″ as it’s the perfect size for my needs. The laptops come with a standard 5400 rpm hard disc, but I’ve replaced the hard disc in a 2009 unibody before so upgrading or replacing that shouldn’t be an issue. I expect I’ll use the disc that comes with the laptop for a few months and see if SSD drives come down a little more as that would be the best option. RAM, you get a pretty standard 4Gb with the 13″ and if I find that I need more in a few months it is pretty easy to upgrade in a similar way to the hard disc. The biggest step forward though on this new laptop has to be the new data port called Thunderbolt. Intel has been working on Thunderbolt for quite a while now, and the idea behind it is all about speed. The bandwidth available to this first version is 10 Gb/s, which when you compare that to USB 2.0 is a massive change. For now though there is nothing I can plug into the new port apart from a monitor. That is until a decent External Drive comes out and moving data about will be quick and painless.